Looking to rent steel-ply concrete panels for concrete forms in Rochester NY, Ithaca NY and Western New York? The Duke Company proudly offers expert CAD (computer aided design) assistance, expert concrete forming advice and can assist you with detailed formwork layout and provide drawings. Serving professional contractors, we carry the full line of Steel-Ply concrete forms, and they are available for rent or for purchase. 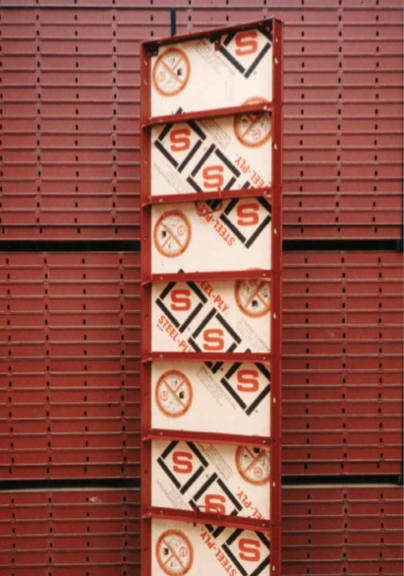 Steel-Ply panels and fillers are highly engineered in a durable steel frame. Side Rail: minimum yield stress = 55,000 psi (pounds per square inch). Cross Members: minimum yield stress = 60,000 psi. Exceptional quality is noted in Symons 1/2 inch 100/30 High Density Overlay (HDO plywood), which creates a smooth finish. tightly sealed edges to keep harmful moisture out and also prevents delamination. The Duke Team is able to assist your professional crew. Symons Steel-Ply forms require very little training. Symons ‘dado slots’ at cross members greatly simplify the placement of ties. In addition, hardware slots are conveniently located between cross members. Notable safety characteristics include the fact that all components combine to result in 1000 psf rated system. Over 100 standard panel and filler sizes. Panel and Filler Sizes: from 3 foot to 10 feet, in 1 foot increments. Panel Widths = 24 inches. Filler Widths 4 inches to 22 inches, in 2 inch increments.